The original movie spawned three subsequent theatrical releases and a television series of relative success. As the basic premise, an Immortal cannot die unless decapitated â€” the original movie made no peremptory reference as to whether this would have to be done by another immortal in order to work; however the television show later clarified the issue by affirming that any decapitation would suffice to kill an Immortal, even if performed by a mortal or as a result of an accident. All Immortals are engaged in an ancient dispute, at the end of which only one Immortal will be left (thus the movie's catch phrase: "There can be only one") and gain "The Prize." The original movie left many details to the imagination, with some filled out by the later movies and television series: in the original movie, there is no direct reference as to the fact that when the (yet unaware) Immortal receives his or her first fatal wound and "dies", that his or her age at that point is the apparent physical age at which he or she will stay forever. This concept was only formally clarified in the TV show. The original movie also explicitly says that no one knows exactly what "The Prize" is, although it is established that if an evil Immortal obtains it, Humankind would suffer "an eternity of darkness" â€” at the end of the original movie, when Connor MacLeod wins the Prize (according to that storyline), he obtains full mortality, and it is further hinted that the Prize may also consist of infinite knowledge. Among the clearly established facts, Immortals cannot have children and they cannot fight on "holy ground" (the concept of which was not clearly established by the original movie, but later agreed to be any place held holy by any human creed). Amidst the rules that were expanded or retconned by the TV show and the other movies are: the nature of "The Quickening," which in the original movie appears to be the "proximity premonition" between Immortals and a supernatural connection that each Immortal has to the very world, but is later said to be a transference of power and knowledge from a defeated Immortal to the victor of a battle (although this is indicated in the original movie, where the phenomenon resembles closely a transference of power of some kind). Another key change made after the original movie was the existence of female Immortals: the original movie makes no reference to it, but it only shows male Immortals. Yet another aspect of the rules that was never touched originally, but was elaborated by the television series is the "no interference" rule, according to which, once two Immortals engage in combat, no other Immortal may interfere with it at any point. The main difference is that the original movie depicts the end of the battle between the Immortals (later dubbed "The Game"), showing Connor MacLeod as the last remaining Immortal and winner of The Prize. 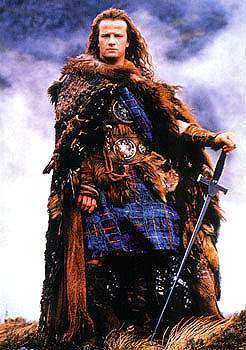 Later movies and Highlander: The Series proposed a retcon, according to which the 1985 final battle between MacLeod and the Kurgan in New York City did indeed take place, but it would not have been the actual final battle; the Gathering had not happened (or at least, had not concluded) and the Game continues. In the original movie, the Gathering (described by Ramirez as follows: " when only a few of us are left, we will feel an irresistible pull towards a far away land, to fight for The Prize ") had taken place in 1985, when approximately six Immortals were left alive; in New York City, which can be considered to have been the "distant land;" since the east coast of the American continent would have been rather distant from the rest of the world up until relatively recent times. Prices current as of last update, 04/08/19 1:44am.